Initially, cloud computing was just a tool to facilitate smooth computing experiences. With time, it has evolved to be a scalable service essential for a modern firm. It has turned out to be a buzz offering a lot of practical value. Cloud Computing has changed the way the business environment operates. The enterprises are striving hard to provide cheap, advanced and secure services to grow themselves in this competing world. Today, the cloud has come a long way and has been widely acknowledged by analysts and enterprises as the driving force to alter the IT landscape. In the era of cloud computing buying servers, updating applications or operating systems or disposing of hardware becomes outdated. The world of internet is sure to suffer without a cloud. According to a report, industries run 79% of their workloads in the cloud. Companies leveraging the emerging trends in cloud computing are expected to grow at a faster rate. Here are a few emerging cloud technology trends to watch in 2019. Hybrid cloud is likely to become the dominant business model in future since it enables a modernised infrastructure with two or more delivery models. Hybrid cloud environment connects a mix of public cloud, private cloud and on-premises infrastructure evolving to suit the unique needs of an organisation. Cloud bursting is the primary reason for its rising demand. Hybrid cloud allows the enterprises to use unlimited resources to process the fluctuating workloads. To balance the organisations demand with supply, it offers close monitoring of the used resources. The hybrid cloud solution is more popular among medical organisations to keep full control over sensitive data. It enables organisations to protect their most confidential data on their terms. In other words, Organizations themselves decide the data storage and conditions to secure the data. Artificial Intelligence is expected to aid the world mainly in providing intelligent business functionalities in future. The amalgamation of both artificial intelligence and cloud computing is “The Intelligent Cloud”. It is capable of processing big data with greater efficiency and speed. The two critical pillars of AI are data and compute. Artificial intelligence has automated businesses with robotic process automation. It automates human tasks in organisations and used for hiring employees for a job. It is increasingly adopted in industries to reduce human workloads. Hardware optimisation is the primary reason behind its rapid adoption. AI- optimised silicon chips can be inserted in any device to carry AI-oriented tasks. Server less architecture is event-driven. In other words, for each request, a state is generated, and once the architecture serves the application, a state is destroyed. Server less computing referred to as Functions as a Service (FaaS). Since the Server less functions are accessed as private APIs, you need to set an API Gateway. The industries are leveraging Server less computing to support a wide variety of dynamically changing needs including IoT, mobile applications and web-based applications. This event-based programming spins up to complete user request and spins down once the task accomplished. It runs typically for a few seconds or milliseconds at a time thus, reducing the cost. Edge computing is shifting the computing functions close to the source – edge of the network. It dramatically reduces the complexity of interconnected systems making it much easier to gather and analyse data in real time. It has a distributed and open-ended architecture that decentralises the processing load. Edge computing enables industrial equipment to make autonomous decisions without human intervention. It is the building block for smart factories equipped with temperature, motion and climate sensors capable of controlling light, cooling and other environmental factors. This will result in efficient use of power. The increasing usage of data is driving the adoption of backup and disaster recovery software among organisations. The thought that hardware failure can result in companies compromising its confidential data leads to the rise of disaster recovery software in the market. Data backup can’t be considered as a “set and forget” solution. It requires regular maintenance and testing to ensure an appropriate facility and easily accessible to the company. The customers enjoy a better business continuity plan since a cloud disaster recovery plan is automated and recovers the files in seconds. The pay-per-consume feature makes it more popular among enterprises with less budget. 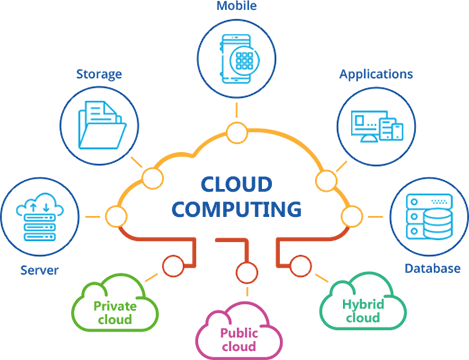 Cloud computing security is a set of policies, controls, technologies and procedures working together to protect cloud-based systems, data and infrastructure. The delivery of cloud security depends on individual cloud provider or cloud security options in place. Cloud security is mainly responsible for securing the data and fighting against hackers. Cloud backup ensures your data is protected from external threats without a need to have an antivirus plan. The security layer in cloud consists of network security, physical security, measuring endpoint security and communication encryption. The traffic moves to and from the cloud through public channels. The encryption like SSL is vital to maintaining the integrity of data. Carefully inspect the data movement and implement the possible checks. Cloud computing growth continues to accelerate with the technological innovations and rising trends. It is capable of providing better security, storage and helps in better decision making. The trends in cloud computing are sure to automate the businesses thus reducing the machine complexity and labour. The companies are leveraging these cloud-computing trends to stay ahead of the competition.